Researchers are looking for better ways of predicting whether children at risk for bipolar disorder will go on to develop the illness. A 2015 study by David Axelson and colleagues in the American Journal of Psychiatry reported that in the offspring of parents with bipolar disorder, diagnoses of sub-threshold mania, depression, and disruptive behavior disorders were associated with subsequent diagnosis of full-blown Bipolar I or Bipolar II disorders six to seven years later. More recently, in an article by Danella M. Hafeman and colleagues in the American Journal of Psychiatry, the same group of investigators has examined how symptoms (rather than categorical diagnoses, as in the earlier study) predict the development of bipolar disorder. 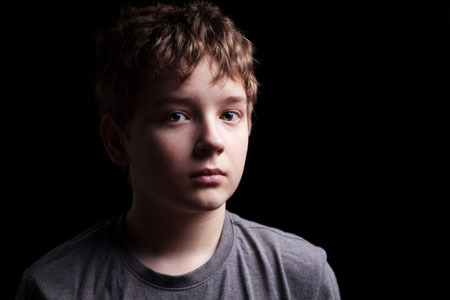 In children and adolescents at high risk for bipolar disorder (because they have a parent with the disorder) three types of symptoms were the best predictors of later bipolar disorder: anxiety/depression at the time participants entered the study, unstable mood or irritability both when entering the study and shortly before a bipolar diagnosis, and low-level manic symptoms observed shortly before diagnosis. The earlier the age at which a parent was diagnosed with a mood disorder, the greater the risk that the offspring would also be diagnosed with bipolar disorder. Youth with all four risk factors (anxiety or depression, mood changes, low-level mania, and a parent who was diagnosed with a mood disorder at an early age) had a 49 percent chance of developing bipolar disorder, compared to a 2 percent chance among those without those risk factors. Childhood onset of bipolar disorder and long delays until first treatment for depression or mania are both significant predictors of a poor outcome in adulthood compared to adult onsets and shorter delays to treatment. Given the high risk that the offspring of a parent with bipolar disorder will develop any psychiatric disorder (74%) and the risk of developing a bipolar spectrum disorder over an average of seven years of follow up (about 20%), vigilance is needed to identify and treat mood and behavioral disorders as they emerge in these children and adolescents. It can be helpful for families to find a method of monitoring children’s symptoms of depression, anxiety, attention deficit hyperactivity disorder (ADHD), oppositional behavior, and mania. One way to do so is by joining the Child Network, a research program publishers of the BNN have developed in conjunction with Johns Hopkins University. Upon joining the network, parents access a secure online platform where they can rate the severity of their children’s symptoms of depression, anxiety, ADHD, oppositional behavior, and mania on a weekly basis. Parents can follow the trajectories of their children’s symptom over time, then print these out to show their children’s physician, assisting in the diagnosis and treatment of early-onset mood disorders. It is noteworthy that the symptoms included in the Child Network rating system are exactly those that are valuable in identifying children at high risk for bipolar disorder according to the studies by Axelson and Hafeman. Even those children who are not subsequently diagnosed with bipolar disorder are still at risk for other disorders such as depression, anxiety, ADHD, and disruptive behavior disorder. These diagnoses can also have a major impact on functioning, and deserve recognition and treatment when they cause impairment to a child’s academic, social, or family life. The weekly ratings in the Child Network also facilitate the recognition of these common conditions. We invite parents with a diagnosis of depression or bipolar disorder who have children ages 2–12 to join the Child Network. Parents who do not themselves have a mood disorder may also wish to join the Child Network if their children are beginning to show signs of depression, anxiety, ADHD, oppositional behavior, or mania. It is important to emphasize that many children with minor fluctuations in mood and behavior will not develop a full psychiatric disorder, but the consistent monitoring of symptoms made possible by the Child Network may facilitate the recognition of those who might benefit from treatment. Join the Child Network by going to bipolarnews.org and clicking on the tab for the Child Network.